Could Proxima Centauri Be Our Interstellar Getaway? What if our planet becomes unlivable and our future selves decide to take to the stars in the hope of starting all over again. Where would we go? Mars could be a good choice as it's the most habitable world beyond Earth in our solar system — though it would be a struggle. But say if we found a planet, not too dissimilar to Earth, orbiting a nearby star? Could that incentivize us to not only become an "interplanetary species" but also an interstellar one? Well, rumor has it that there's a possible "Earth 2.0" orbiting Proxima Centauri, a red dwarf star that's right on our cosmic doorstep. Located only 4.25 light-years away, Proxima is believed to be gravitationally bound to the binary star system Alpha Centauri, a system that has also undergone much scrutiny for its exoplanet potential. To have an exoplanet with any Earth-like qualities so close to the solar system would be an incredible stroke of luck, considering that the most Earth-like exoplanet discovered so far is Kepler-452b, which was announced last year to much fanfare. The kicker is that this alien world is 1,400 light-years away. Barring any huge science fiction-esque strides in interstellar propulsion, it's highly unlikely that such a distant world will get a whiff of humanity any time soon. But a hypothetical planet orbiting a star only 4.25 light-years away? That doesn't sound so bad. What's more, if (and that's a big IF) there is an exoplanet with a few Earth-like qualities orbiting Proxima Centauri, its existence could transform the way we look at the stars. We might start to see interstellar space as a challenge we can aspire to physically explore rather than the impenetrable void it currently is. "The discovery of a habitable planet orbiting Proxima Centauri could have a profound impact on humanity's interstellar future," said advanced propulsion expert Richard Obousy, co-founder and director of the non-profit group Icarus Interstellar. "It would be easy to dismiss the prospects of an interstellar mission if a habitable planet were found perhaps fifty, or even hundreds of light-years away. However, an 'Earth 2.0' on our galactic doorstep almost teases us into us taking action." Over galactic distances, Proxima isn't so far away. But appearances can be deceiving. Considering that humanity's only bona fide interstellar probe, Voyager 1, has been travelling for almost 39 years and it has only just left our sun's heliopause, sending any kind of probe even to our neighboring star would require transformative propulsion technologies that are at least 50-100 years away at the current rate of technological innovation, Obousy told Discovery News. There's also the question of time. How long would we be prepared to wait for a mission to travel to Proxima? Although Voyager 1 isn't traveling in that direction, it would still take the probe tens of thousands of years to travel the distance. Human history has shown that we are often willing to commit hundreds of years to one project (such as the often multi-generational efforts to build the Medieval Cathedrals); can the same patience and fortitude be expected when we launch a probe to the stars? In reality, an interstellar mission would likely require a much shorter timeline. RELATED: 'Firefly' Starship to Blaze a Trail to Alpha Centauri? "Ideally, a mission would take fifty years or less," said Obousy. "This would mean that people working on the mission early on in their career would have a realistic chance at seeing the mission completed in their lifetime." Currently there are groups that are working on this problem, including Icarus Interstellar. According to Obousy, some propulsion possibilities include "fission fragment rockets, fusion rockets, antimatter rockets and beamed energy propulsion systems of the kind that the Breakthrough Starshot Initiative is examining." Indeed, Breakthrough Starshot, a project backed by entrepreneur Yuri Milner and supported by theoretical physicist Stephen Hawking, hopes to fabricate tiny probes that will "ride" powerful laser beams into interstellar space. If the technology is viable, it's possible that swarms of these probes could attain the speeds required. Icarus Interstellar iscurrently researching a number technologies and techniques that may bridge interstellar distances and other groups like the 100 Year Star Ship project is currently setting up an infrastructure for a possible human mission to the stars in the next century. RELATED: Earth-Likenesses: Have We Discovered Earth 2.0? But developing and maturing the technologies needed for such a monumental mission to our neighboring star will require an international framework and, as pointed out by Obousy, if the richest nations pooled their resources and committed funding not seen since the Apollo Program in the 1960s, our interstellar future might be closer than we think. For this to happen there needs to be an inspirational moment that has the power to both unite the planet and inspire us to commit to a multi-generational project that could develop an industry around interstellar travel and enrich our knowledge through scientific breakthroughs. As we've learned from cutting-edge science research throughout history, we can expect unforeseen spin-off technologies that will impact the world in unexpected and beneficial ways. The goal would be to reach for the stars while enriching life on Earth. So, could a possible "Earth-like" planet orbiting Proxima Centauri be the inspiration we need? 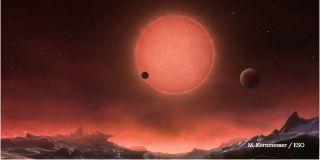 Before we get too excited about watching the Proxima sunrise over an alien shoreline, it's worth remembering that this latest exoplanetary news is based on a rumor that was first aired by the German magazine, Der Spiegel, saying that the European Southern Observatory (ESO) will be making the announcement by the end of August. The ESO has so far declined to comment. "The still nameless planet is believed to be Earth-like and orbits at a distance to Proxima Centauri that could allow it to have liquid water on its surface -- an important requirement for the emergence of life," said the magazine. "Never before have scientists discovered a second Earth that is so close by." Whether or not the "Earth-like" exoplanet is anything more than a rumor is hard to tell for now, but there are many questions surrounding its habitable potential. If it really is an Earth-sized world orbiting within Proxima's "habitable zone" -- the distance from a given star that is neither too hot nor too cold for liquid water to exist on a planet's surface -- its orbit will be very compact, likely making the alien world tidally locked, with one hemisphere in constant light and the other in constant darkness. This trait would be very un-Earth-like. Also, it is known that the red dwarf is a stormy little star, blasting powerful flares into space, causing its brightness to vary. For the world to be even vaguely cozy for life (or visiting humans), it would need to have a hefty atmosphere and magnetosphere to deflect the worst radiation that can be thrown at it. If this world does exist, there are a lot of conditions that need to be met before we can confidently start calling it "Earth 2.0." The prospect of having a world even remotely habitable so close by, however, means we can make detailed astronomical observations, which might be enough to spark interest (and, hopefully, funding) into the interstellar sciences. And should this happen, we might be on the verge of a new age for humanity. "The truth of the matter is that Earth 2.0 orbiting Proxima Centauri means that this is as easy as it could get for us, in terms of difficulty," said Obousy. "That's not to say that it's an easy challenge, far from it, but we could not wish for better terms as we begin to reach out into our cosmic neighborhood." Originay published on Discovery News.